Vicki is an extremely talented self-taught textile artist. The surrounding countryside and beautiful coastline of Whitehead is where she draws inspiration. She uses her love of texture and vibrant colour to design her distinctive textile wall art. 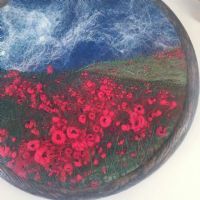 Using locally sourced sheep’s wool, she hand dyes and layers the fibres, before wet felting, and finally embroidering to add further depth and detail to her unique work.